Our 2017 season got underway on Saturday 1st April with the weather being kind for the opening of the green, performed by the President’s wife Fiona Pender. President Tommy Pender introduced his green party – Jack O’Malley (DBA), Ronnie Jardine (Past President), John Millar (Depute Provost, West Dunbartonshire Council), Nancy Rodger (Ladies’ President), Frank McCarry (Honorary President & Seniors President), Brian Mooney (Treasurer), Jim Daly (Vice-President) and John Rainey No.2 (Secretary) – to the assembled members and thanked the invited guests for joining us on our opening day. 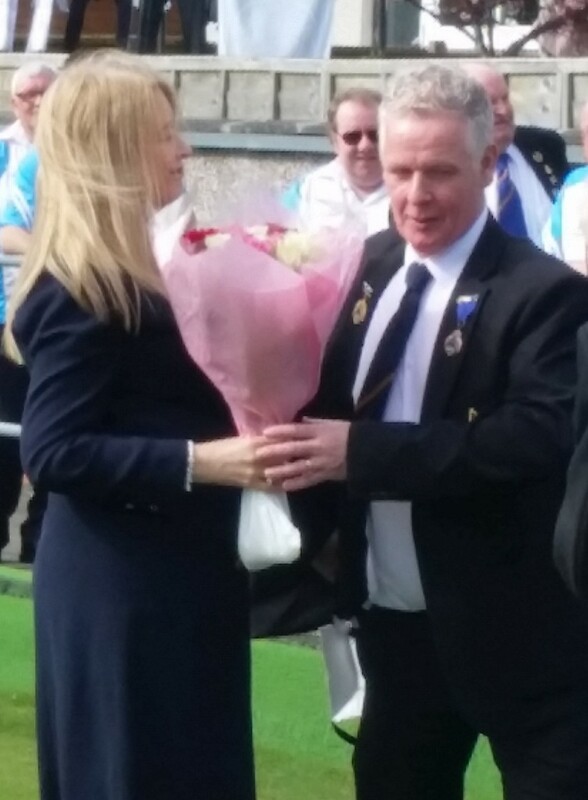 With the formalities completed Fiona delivered the first jack and bowls of season 2017 to a round of applause from everyone present before officially opening the green and wishing Renton Bowling Club every success for the coming year. Fiona was presented with flowers and a small gift by Pele on behalf of the Club as a token of our appreciation. Invited guests then took to the green for a game with bottles for the first touchers. The winning rink received bottles kindly donated by Honorary President, Frank McCarry. After the bowls the invited guests, members and their families retired to the hall for a buffet prepared by Billy & Dehlia Murray. Afterwards, an enjoyable time was had in the members’ lounge with John Fullerton (and Pele!) providing the entertainment.